A Richmond Personal Injury Attorney Who Cares About Your Story. More than anything, I care about you and your story. In order to get everything for your accident and recover lost wages, injuries, and hospital bills, your story needs to be told properly. I will listen to your story and then make sure the right people hear it, as well. Does My Name Sound Familiar? You may have heard me on the radio. 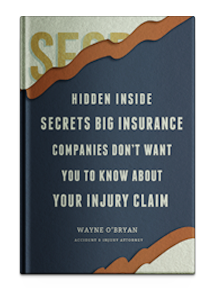 What Secrets Don’t Insurance Companies Want You to Know? Want to know what hidden secrets insurance companies are keeping from you about your insurance claim? Before you settle for less than you deserve, download a copy of my free book that explains their most common tricks. Protect yourself by checking local traffic reports, following the rules, and staying alert. If you have been involved in a car accident in Virginia, an experienced lawyer can help. Call Wayne O’Bryan at (800) 222-4189 today.